· Mod Post: March Challenge!! · Mod Post: A New Challenge for February!! 1st-Dec-2016 03:36 pm - I miss this place!! Summary/Other Info: Christian isn't a hearts and flowers kind of guy. Summary/Other Info: Jasper's sneaky attempts to cuddle at night end in the complete opposite of what he was expecting. Dish/Jasper Slash! 2nd-Feb-2015 03:13 pm - Mod Post!! New Prompt!! Its been a long time but I finally have a new prompt for the group!! I'd love to see some activity!! I apologize for the long delays since I've had tremendous computer issues lately but I got a brand new laptop for the holidays and that hopefully won't be an issue any longer!! Love you all and hope this will get your creative juices flowing!! 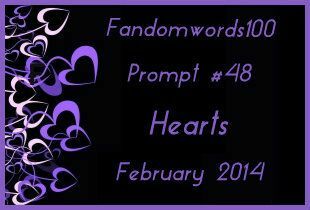 Now onto the new prompt for the month of February!! All drabbles must be exactly 100 words and must use the monthly prompt. Each drabble is worth 20 pts for your team total. If you use any of the bonus words in your drabble you will gain an extra 5 pts for each bonus word used for your team. Happy Drabbling and Have Fun Everyone!! 20th-Sep-2014 06:08 pm - Group Update!! So sorry that this group has been inactive for a while but like a Phoenix, it is about to rise from the ashes and live again... at least I'm hopeful so. Thank you all for your vast amount of patience!! We'll be starting afresh with new monthly Team challenges and our prompt a day December challenge which is an individual challenge!! Hope to see many of you participate!! Summary: Caroline has no regrets. 8th-Mar-2014 05:26 pm - Mod Post: March Challenge!! Summary: Kate observes the night sky. Summary: Stiles messes up during class. 1st-Feb-2014 04:46 pm - Mod Post: Group Updates!! I'm so excited about starting another year with this wonderful group!! Note to those who participated in the winter/holiday challenge... I'll work on banners tonite and hopefully get them posted sometime tomorrow!! Thanks to everyone who wrote, the stories were all lovely as can be!! We had a wonderful turnout!! Hope to see everyone participate as well in the February challenge. I'm postponing the annual drab-a-thon until next month, so I hope everyone is looking forward to that as well!! 1st-Feb-2014 04:32 pm - Mod Post: A New Challenge for February!! Magic is a mysterious thing. It adds drama to a story and opens up possibilities... Lets see what everyone here does with it. This is the final prompt for this challenge and I want to thank all those who have participated so far... I'm extending the challenge until January 20th and then I'll post the February Challenge a bit early to start out our regular challenges!! Thanks to everyone for making this another successful year as a group and I hope you'll all be along to write this coming year. I've been a bit amiss as a mod these past months but I plan to stay on top of it this year, its one of my resolutions!! Hope everyone has a Happy New Year and I'll see you in 2014! !